If you need a portable bathroom for an outside event or for a construction site, knowing about outdoor toilets will help you with your selections. You may have a few questions about porta john rentals, ranging from what is suitable to how they operate. Here are the basic FAQ to consider. What Are the Choices for Portable Bathrooms? There is an array of choices for portable bathrooms ranging from standard units to luxury trailers. Basic stand-alone units are usually equipped with a non-flushing toilet with a holding tank, toilet paper dispenser, and sometimes a urinal. Usually, separate hand-washing stations are rented. Upgraded versions include an in-unit sink with soap and a hand dryer, which eliminates the need for a separate hand-washing station. There are larger units that are handicap accessible and those that feature baby changing stations. Finally, luxury trailers feature multiple stalls along with amenities, such as an in-unit air conditioner, counters and cabinets, and even a shower. How Do You Figure Out How Many You Need? To figure out how many portable bathrooms you’ll need, you must consider the event, how long it will be, and the number of people in attendance. One unit for every 75 people is a good starting point but add another unit for every four hours. Consider one unit for men and another for women, and factor in 20% more units for alcohol use, which will increase how many visits guests will make. For worksites, one outdoor toilet will accommodate ten employees for a regular 40-hour week. Make sure there is at least one hand-washing station for every four porta johns. Usually, the holding tank can go through 80 to 100 uses before service is needed. While they will contain pathogens, the risk is no higher than a public restroom, especially if they are regularly serviced to manage bacteria. Usually, porta johns have a liquid in the toilet that deodorizes and neutralizes human waste. There are also enzymes to help break down bacteria more quickly. How Is Waste Drained & Does It Harm the Environment? Weekly services (nightly for heavy usage) will purge tanks and pump out waste. It is then carried to a wastewater facility where it is processed just like any other sewage, following the same environmental regulations. Once the tank is pumped, the entire unit is cleaned and sanitized, and deodorizers and paper goods are replenished. 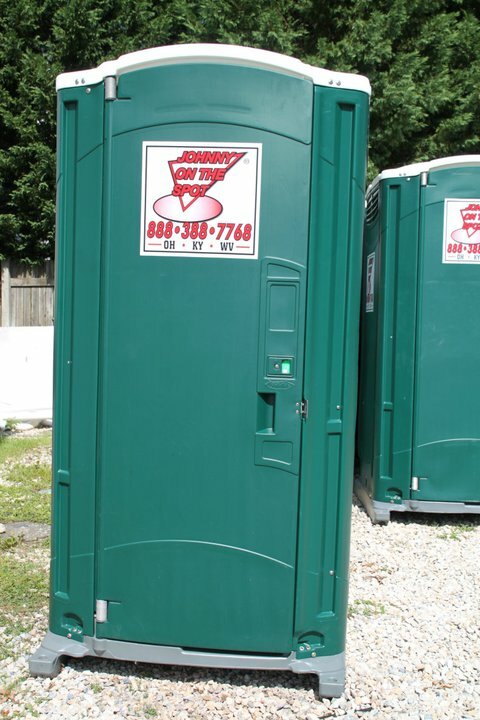 When you need portable bathrooms in the Ohio, West Virginia, and Kentucky Tri-State area, call Johnny on the Spot. Located in Ironton, these porta john rental professionals bring more than 60 years of affordable service to every client. Their portable bathroom units are perfect for outdoor weddings, festivals, and outside projects. For information on their rentals, call (888) 838-7768 or visit their website for examples of their outdoor toilet selections.